Food safety, to no one's surprise, continues to be the most critical issue facing U.S. food manufacturers. Concluded the same week the Bioterrorism Act went into effect, our third annual Manufacturing Trends Survey found respondents retooling their hazard analysis and critical control points (HACCP) programs, tightening access to the plant--including the installation of video cameras and card access systems,improving traceability backward into their supply train, and sealing trailers and bulk storage tanks. But most of all they were training. "Training, training, and more training!" to quote the president of a small Pennsylvania processor. Several respondents noted new training programs specifically for bioterrorism. In a surprising side-issue, the overwhelming majority said they are planning for more production in 2004. Nearly 32 percent said they anticipate production increases of 10 percent or more in the new year; 35 percent said they plan on 5-9 percent more; and 31 percent plan on "about the same" level of output. Just 2 percent plan on decreases. This could turn out to be a pretty good year. There may be a heightened sense of urgency since Sept.11, 2001, but food safety should be a perennial concern. Indeed, it scored first in both of our previous surveys. "It's an issue all the time, not just this year or last year," said Silas Strother, sanitation manager at a Kraft bakery in Atlanta. "If customers cannot rely on you to provide a safe and wholesome product, you'll be out of business." And customers are willing to pay more for the security that goes with buying brand names, Strother adds. "That's an additional value in our products. It's not something you can communicate to consumers, but somehow they know how careful we are with the whole supply chain. Folks are willing to pay a premium for our products because of that care." "Food safety is the No. 1 issue as we import foods from around the world and deal with countries that do not have the same standards that we do," said an executive at a New Jersey company specializing in ethnic foods. "Mexico is a prime example. I believe twice last year the FDA issued warnings about cantaloupes, and now the green onions [believed to have caused hepatitis A outbreaks at four U.S. restaurants in September through early November]. It will take Chi-Chi's a very long time to recover, if at all." Responsibility for food safety does not stop at the back door. "One of my top concerns for next year is food safety while the product's in transit," said the operations manager of a northern Indiana poultry plant. "Some of it relates simply to better temperature control on the refrigerated trucks. But we're also looking at better locks and seals on the trucks to make sure there's no tampering after the product has left our plant. And training of the drivers to make them conscious about the security of their load." Nor is it strictly about food for human consumption. "Salmonella doesn't affect dogs or cats like it affects people, but think about it: You're putting your pet's food bowl on your kitchen floor. You're handling the product. A lot of little kids will pick up and eat pet food. So we have just as much responsibility for food safety," said Bruce McConville, maintenance planner and scheduler at Nestle Purina Petcare's Davenport, Iowa, plant. Many respondents said the biggest factor in food safety is training. "I believe everyone in the industry understands that training of employees is the most significant way to improve food safety," said the president of that Pennsylvania processor, who asked that his name not be used. More training also has been the solution for better sanitation, with 96 percent choosing that answer for sanitation efforts already under way. Next was a HACCP program (82 percent), followed by improved pest control (73%). Further down the list were more sanitary equipment (51 percent) and rapid microbial detection systems (38 percent). The Bioterrorism Act should have been top of mind, as this survey was conducted the week before the Dec. 12 deadline. Despite some anxiety about the complexity of the act's registration process, almost all the respondents who mentioned it said it went smoothly. One complained it took two people two hours to get the system to accept the password given his company,upper and lower case letters, some numbers and a "special character." Another processor said he registered his plant but was not sure if FDA wanted separate forms for his company's 38 warehouses, most of them unmanned. It's apparent ingredient and food traceability programs have caught on in a big way, with 85 percent saying they had such a program in place. After food safety, you could throw a hat over the next three issues. Labor concerns were a distant second, followed closely by automation. "We have a new labor contract to negotiate in 2005, and our interest is in lowering our labor costs and making our production facility more efficient," said a man at a large New York City-area beverage facility. 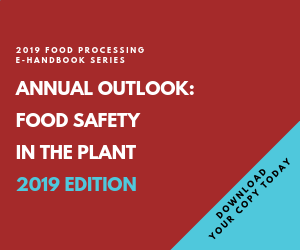 Automation still seems a bit slow to catch on in the food industry, with less than 12 percent of our respondents reporting their entire plant is automated. Seventeen percent report their full production line is automated. But sections of production are well along (42 percent) and packaging sections are even further along (47 percent). But the majority said they were planning to spend more on automation this year than last. The favorite medium for automation in the food industry is the programmable logic controller (PLC), favored by 62 percent of respondents. Personal computers are far back at 27 percent. And customized software beats off-the-shelf software by better than two to one. Plant security also is a critical concern, with 93 percent saying they would take additional security steps in 2004. The most popular solution was physically securing the facility (88 percent), with 72 percent saying they would beef up employee identification programs and 65 percent installing some surveillance equipment. Write-in answers to the security question included employee background checks and digital record-keeping. "When we [recently] significantly increased out warehouse size, we realized the need for more security," said McConville of Nestle Purina. "So now there's surveillance all around the grounds. The only entrance that didn't have a live guard--the entrance from the employee parking lot--now has a turnstile that you need an employee pass card to get through." Questions on energy elicited only a lukewarm response from most of our respondents. But it was a burning issue for the 18 percent who were affected by the mid-August blackout around the eastern Great Lakes. Far and away, the biggest solution among those who were affected will be cogeneration on site. "We are looking at power generation packages for critical areas," wrote a manufacturing exec at a large beverage plant in Tarrytown, N.Y. "We are considering purchasing our own generator to reduce loss and spoilage in case of long term outages," said a man at a New Jersey plant. Another New Jersey plant is considering "modified procedures relative to retort procedures during power outages." At the very least, several respondents said the blackout forced them to develop an emergency plan in case a long-term and widespread power outage hits again. Some plants are looking at alternate suppliers. A Mount Vernon, N.Y., beverage plant is working with an energy consultant. Even facilities not in the blackout areas were affected. "We were affected not by the power outage but by over-voltage due to all the other plants being down," said reported a Memphis, Tenn., plant. A beverage facility in Suffolk, Va., "was indirectly affected by central servers losing power in the blacked-out area. Now, more effective back-up power sources are being installed for computer systems." There's a lot or work to be done in food plants in 2004. Plants will require more work on food safety, new work on physical security and constant work to improve processes. Rather than being driven solely by ominous forces, as in the past two years, it's nice to see increasing production returning as a force to be reckoned with. This survey was sent by e-mail to selected groups from our circulation list. It was conducted during the first week of December, with 149 responses accepted up through December 12. Twenty-two percent of the respondents were from facilities with fewer than 50 employees; 6.3 percent from plants of 50-99 people; and 71 percent represented plants of more than 100 workers.